As our military family prepared to move from the island of Guam back to the mainland some years ago, lots of prep went into this across-the-world PCS. As I sorted items to set aside for our smaller shipment, my young daughter curiously asked what I was doing. I told her these were the items we didn’t want the movers to pack quite yet, and she nodded and went off to play… or so I thought. Within minutes, she walked past me with a Post-It note stuck to her forehead with the words “Don’t Pack” carefully written in her cute second-grader’s print. I laughed till I cried at her sense of humor! Of course, even a child knows (I hope!) they won’t be packed with the household goods, but perhaps a few of the following “don’ts” aren’t so obvious. 1) Don’t be surprised if your household goods don’t arrive when you think they should. And please DON'T pin all your hopes on a certain day and DO consider dates to be fluid, especially for an overseas move. And then you’ll be happily surprised if your things arrive early! 2) Don’t expect your active duty spouse to be completely available. In fact, they probably won't be. 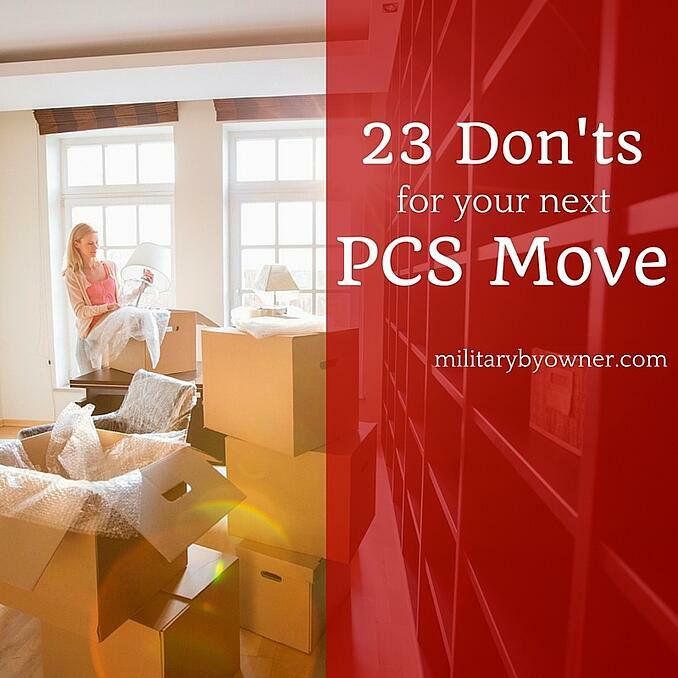 Perhaps your spouse is deployed or TDY, so you know you'll be handling the move alone. Even if they're in the area, don’t forget they may be busy with out- or in-processing, so don’t be surprised if your spouse is not able to help as much as you’d prefer. 3) Don’t forget your pets. While I don’t think you’ll actually physically forget your pet, make sure to start needed paperwork and vet appointments well ahead of the move. 4) Don’t buy or rent a home sight unseen if you can help it. Tanya Saenz advises: “Look around, ask the locals your spouse works with, because most likely they are from the area and can give helpful advice. Sometimes the stress of moving causes us make hasty decisions just to get it over with." However, if you find yourself in a situation where you're time-pressed to make a housing decision, read these expert tips about buying a home unseen. 5) Don’t forget to document your valuables. Stories abound in the military world about valuables and even entire shipments lost forever during a move. “Use your phone or video camera and walk through your ENTIRE house before any packers come! Take pictures of everything. Open all drawers. (Video is better because you can describe what's in there). This is important if you need it for claims and insurance," says Katie Pritz. You know you’d help out another military family if they needed it, so if your friends are offering help with pets, kids, meals, cleaning…take them up on it! This is not the time to poo-poo offers of real help or for standing on ceremony. You'll pay it forward when it's your turn! "Don't forget to ask for help if you need it. It is so easy during a move to focus on 'you' and the stressors that come with it and become overwhelmed. But other individuals have been in the same situation and they are so willing to help!" 7) Don’t schedule your pack out dates while other big life events are going on. Though life has a way of throwing many things at us at once (the time my family moved from Germany to the Pacific as our oldest son graduated and my husband was en route home from a year-long deployment comes to mind! ), if you're aware of other upcoming big events, plan your packing and moving dates around those as best you can. 8) Don’t stop living where you are now in anticipation of the move to come. I've known people who completely shut down and disengage upon receiving orders. While you're busy thinking ahead, don't forget to live in the now, too. “Find something new to discover or experience each week. ‘Shortitis’ can easily steal life and relationships if we let it!” says Heather Rodriguez. 9) Don’t forget to mark the must-have-now items. Set aside necessities you’ll want right away (towels, sheets, etc) and have them packed in a separate box and marked clearly. Kate Veach adds, "Make an additional mark on the boxes with towels and bedding." 10) Don’t accidentally pack anything you’ll need in the transition or en route. You can mail boxes ahead to your new location via a PSC or PO box, or tuck what you’re able into your luggage. 11) Don’t sweat the small stuff. And do expect something unforeseen to happen! Hurricane Sandy bore down on our area several years ago as we were staying in temporary lodging, house packed up, and ready to PCS. While that's not necessarily 'small,' the forced delays because of all the government offices being closed and camping out in TLF longer than we'd hoped were small compared to what others dealt with. Don’t put all your moving tasks off till the last minute, or you'll find yourself running around at the end with more tasks than time. 13) Don’t expect everything to be the same in the new location. 14) Don’t be reluctant to discuss travel pay with your spouse. 15) Don’t forget to set important papers aside. 16) Don’t hesitate to pay for cleaners if you can. 17) Don’t let your packers put all the hardware in one box. Movers will often put all screws or other loose pieces from furniture together into one box which can be a mess to sort out when you unpack. 18) Don't forget to empty your trash! And clean out your dirty dishrags from your sink. If you've also been the recipient of a carefully packed half bag of trash or a moldy dishrag as you unloaded a box, you know what I'm talking about. And here's an ew factor I hadn't considered. Jan Jones remembers, "Empty your diaper bins before the movers set foot inside your home!" 19) Don’t be unaware of what’s required of your movers. Whether it’s unpacking or removing boxes, make expectations clear ahead of time and ask for a full unpack if you want one. 20) Don't forget to treat your movers well. Provide cold drinks (water, at least) and let them know they're free to use your bathroom without having to ask each time. Our family usually feeds them at least lunch and the movers have always seemed to appreciate it. We also tip. Cassandra adds, "Don't forget to be kind to the movers. They get very tired of being treated like second-rate citizens and everyone thinking they are going to rob the blind. They deserve respect, and since we are entrusting strangers with all our earthly possessions, be extra nice!" 21) Don’t forget to use up the food in your pantry. Plan meals around your perishable goods (I firmly believe there should be a "Chopped: Military Spouse Edition" as military spouses are experts at whipping up gourmet meals out of items like creamed corn and a couple packages of ramen noodles!). And get all those little bottles of spices sealed up and ready to go—those can usually be packed. You may want to put them in storage containers or Ziplocs yourself in preparation. 22) Don't play the blame game. "Don't blame your spouse for things they have no control over. Remember, it can be just as emotional for him [or her] as it is for you and the kids. Remembering that made going to bed at night in a strange place MUCH more bearable. Now, all these years later, we still love being with each other more than anything else!" Everything will work out in the end; I promise! Angie Drake reminds us, “Even in the worst moments when it seems like nothing will come together, it always works out…even when the military changes your location only a couple of weeks out from moving!" Since I can’t cover every possible scenario in this short space and I'm sure I missed something, I hope you'll share YOUR best "Don’t" when it comes time to PCS! A sense of humor is so important during a military relocation. 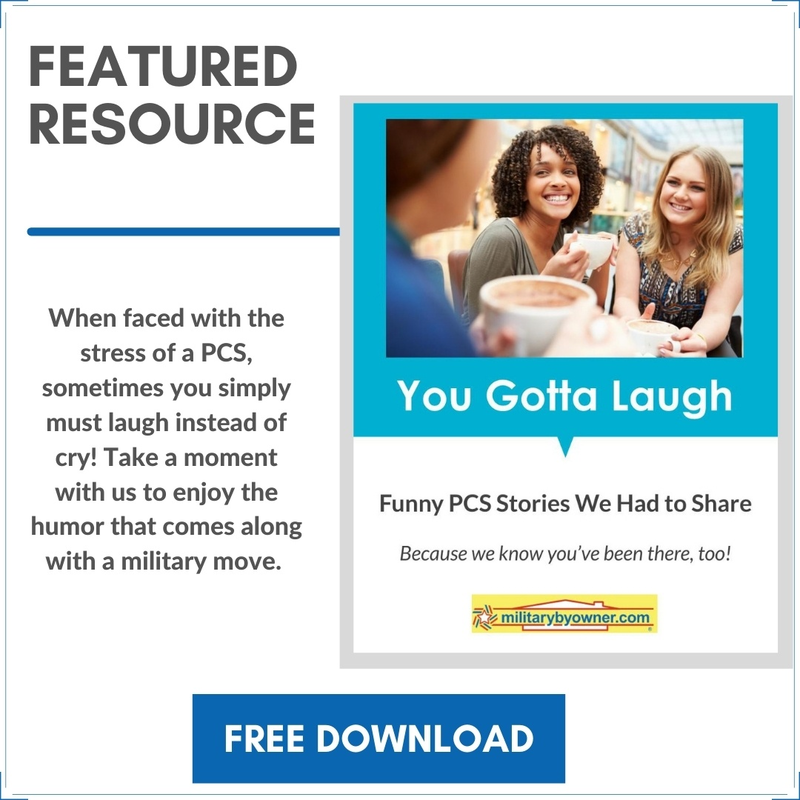 Download this compilation of funny PCS stories!